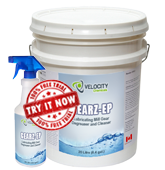 GEARZ-EP is a natural lubricant fortified with extreme pressure additives for lubricating, degreasing and cleaning of mill gears while operating under load. Shut off lube system to the gear and open inspection cover. Mount sprayer cover so nozzles (4-6) are equidistant apart and 12-18” from the gear face. Cover the inspection opening with plastic to reduce back spatter. Begin applying GEARZ-EP at approximately 10 liters (~2.5 US gals) per minute. Continuously monitor gear temperature with an infrared sensor. Monitor progress of grease removal with a strobe light. Start Grind out procedure when approximately 2/3 third of the grease has been removed. Maintain application of GEARZ-EP during removal of the final third of grease, since the GEARZ-EP is the only lubrication for the gears. Install inching device or crane to slowly rotate the mill. Rinse gear with high pressure (preferably hot) water wash and dilute (i.e. 1%) solution of HEAVYWEIGHT or WONDERSOL cleaner. Depending on the type of grease used, and the length of time from the last gear clean, some hand scraping may be required prior to inspection of the gears.